General Motors Co. (GM.N) will cut more than 14,000 salaried staff and factory workers and close seven factories worldwide by the end of next year, part of a sweeping realignment to prepare for a future of electric and self-driving vehicles. Four factories in the U.S. and one in Oshawa, Ont. could be shuttered by the end of 2019 if the automaker and its unions don’t come up with an agreement to allocate more work to those facilities, GM said in a statement Monday. Another two will close outside North America. The Detroit-based company’s shares surged on the plan, which includes abandoning some of its slower-selling sedan models. The planned job reductions, which triggered political pushback in the Midwest U.S. and Canada, come on the heels of surprisingly strong third-quarter earnings. GM Chief Executive Officer Mary Barra is trying to make the company leaner as U.S. auto demand slides from a record in 2016 and sales in China -- GM’s other profit center -- are also in a slump. Barra is also shifting resources toward building electric cars and, eventually, vehicles that drive themselves. GM jumped as much as 7.9 per cent to US$38.75, the highest since July, as of 12:20 p.m. in New York trading. The stock is still down about 7 per cent this year. 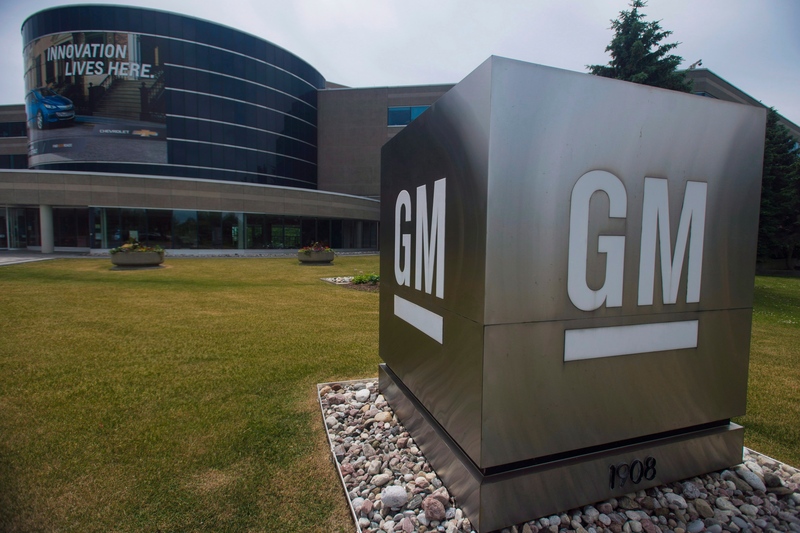 The plan to lop 15 per cent of salaried workers follows a round of buyouts that GM offered to about a quarter of its longer-tenured workforce at the end of October. GM said the cuts will boost automotive free cash flow by US$6 billion by the end of 2020 and result in one-time charges of up to US$3.8 billion in the fourth quarter of this year and first quarter of 2019. Do you think enough has been done to protect auto industry jobs in Canada? GM also said that the company will jettison the Buick LaCrosse, Chevrolet Impala and Cadillac CT6 sedans next year. The Chevy Volt plug-in hybrid will also be dropped along with the Chevy Cruze compact, which will be made in Mexico for other markets. Too many of GM’s factories are operating on a single shift to build models that have fallen out of favor, leading its plants to run about 1 million vehicles short of their full capacity, said Kristin Dziczek, vice president of industry,labor and economics for the Center for Automotive Research in Ann Arbor, Michigan. The likely shutdowns have already opened up GM to political pushback, with Canada’s Prime Minister Justin Trudeau tweeting that he has expressed “deep disappointment” with Barra directly. The U.S. plants are in places that have been economically devastated by job losses and pressure on wages for decades, which helped lead to the 2016 election of Donald Trump as U.S. president. U.S. Senator Rob Portman, a Republican from Ohio, said he’s “deeply frustrated” with GM’s decision to shut down a plant in Lordstown and is pressing Barra to come up with an alternative product for the factory. A White House spokesperson didn’t immediately respond to a request for comment. Barra is reducing staff from operations that make conventional cars and hiring people who can design electric cars or add software prowess to GM Cruise LLC, the automaker’s autonomous vehicle unit in San Francisco. That means GM needs to allocate more resources to purely electric cars, unlike the hybrid Volt, and to autonomous technology, Barra said. GM is cutting more than 6,300 hourly and salaried workers at its plants and 15 per cent of the salaried workers in North America for a total of more than 14,000. The totals are imprecise in part because there may be some double-counting with employees who are taking the October buyout offer. The company has marked a sedan plant in Detroit, a compact car plant in Ohio, and another assembly plant outside Toronto for possible closure. Also at risk are two transmission plants, one outside Detroit and another in Baltimore.